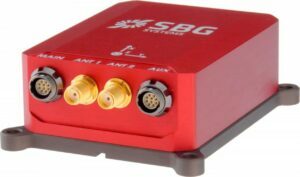 SBG Systems has announced that its Ellipse-D inertial navigation system has been chosen by Viametris to equip their new SLAM (Simultaneous Localization And Mapping)-based mobile mapping system, the vMS3D. GNSS: When the GNSS receiver provides reliable data, for instance in open sky environment, the solution relies on its position. If a GNSS outage or disturbance occurs, the system chooses between inertial or SLAM-based data. SLAM: Position computed from SLAM is preferred in dense environments where surrounding objects are very diverse and close, such as in urban canyons or forests. SLAM capabilities are limited in environments where objects are too far or not distinguishable. Inertial: Velocities and orientation information provided by the Inertial Navigation System (INS) are able to assist the navigation in all the cases where GNSS and SLAM are limited. The Inertial Navigation System provides roll and pitch to constraint all LiDAR data, so the point cloud is referenced at ground level. Turn rates are also very helpful, especially when an abrupt change of direction occurs. Indeed, orientation compensation is required between two scans when the LiDAR is in motion. “The principle uses either image or LiDAR based localization to determine the distance between the sensor and surrounding objects. Feature-based SLAM uses corners or particular shapes to calculate the position of the sensor. However, in areas without feature to locate, such as land fields or wide open area, this approach falls short,” said Jérôme Ninot, President and Founder of VIAmetris. “Ellipse INS provides very, very precise velocity data,” continued Mr. Ninot. The innovative SLAM computation allows VIAMETRIS to rely on miniature inertial sensors while other systems require higher accuracy inertial systems. Ellipse sensors deliver 0.1° accurate attitude. “With an integrated INS like the Ellipse-D, offering a single communication interface and built-in synchronization to the GNSS and LiDAR, we have been able to concentrate on our SLAM expertise,” added Mr. Ninot.